By using the Release mode setting on your Nikon D3400, you set the camera whether to capture a single image each time you press the shutter button (Single Frame mode); to record a burst of photos as long as you hold down the shutter button (Continuous mode); or to delay the image capture until a few seconds after you press the shutter button (Self-Timer mode). 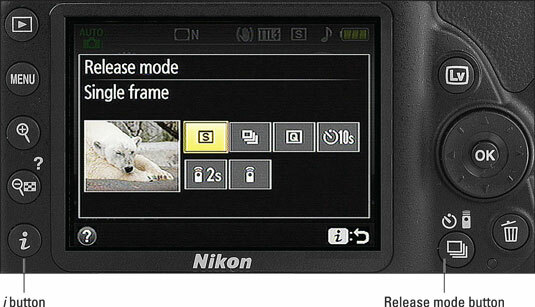 You also get Quiet Shutter mode, which dampens the normal shutter-release sounds, and two options related to shooting with the Nikon ML-L3 wireless remote control. On the Information screen and Live View display, the current Release mode is indicated by the icons labeled here. In the figures, the S symbol represents the Single Frame release mode. Note that the Live View screen in the figure shows the default data-display mode; if your screen shows a different assortment of data, press the Info button to cycle through the available display modes. This S represents the Single Frame Release mode, which produces one picture for each press of the shutter button. To adjust the Release mode setting, press the Release mode button, labeled in the following image, to display the selection screen shown. The figure shows the screen as it appears during normal viewfinder photography; in Live View mode, the screen appears superimposed over the live display. Either way, use the Multi Selector to select a setting and then press OK. The Release Mode button offers the fastest access to the setting. Notice the symbols at the bottom of the screen shown on the monitor? Symbols at the bottom of settings screens such as this one represent buttons you can press to perform certain actions. For example, the i symbol with the return arrow (refer to the lower-right corner of the display) indicates that you can press the camera’s i button (labeled in the figure) to exit the settings screen. Similarly, the question-mark symbol displayed in the lower-left corner of the Release mode screen tells you that if you press the camera button marked with a question mark (the button just above the i button), you can display a screen that offers a bit of information about the setting you’re adjusting.